As soon as he landed in the city he unpacked his shell, ditched his humans, and set out to learn some fascinating facts about Porto. 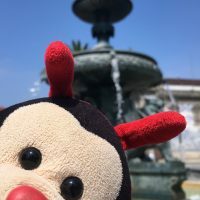 Travel Bug discovered that Porto’s Latin name is Porto Calus and it’s one of the oldest cities in the nation. The name ‘Portugal’ comes from the old name for Porto. So instead of the city being named after the country, in Portugal, the country is named after this city. Porto has a total of 6 bridges spanning the Douro River. The most iconic of these is the Dom Luís 1, which connects Porto to the city of Vila Nova de Gaia. The bridge, a fancy metal and steel arch was initially suggested by Gustav Eiffel of Paris tower fame but was rejected. When the bridge was built, it was the longest of its kind in the whole world. Porto is famous for the quality of its sweet fortified wine, which is called Port. The city has been producing Port since 1756 and Porto’s Douro River Valley is the third oldest winemaking region in the world. Travel Bug likes wine (as does his human Mum) and had fun tasting different ports at the many wineries along the Douro River. Do you have any more fascinating facts about Porto for the Travel Bug?